From the Covet Collection of stackable bracelets. 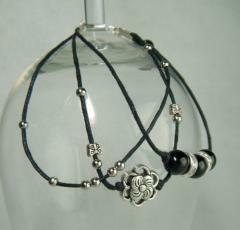 This monochrome bracelet incorporates three Black Agate rounds separated by sparkling crystal rondelles, a flower and tiny butterfly beads, simple black cords and Silver Plated details. I've allowed some of the detail beads to float, which is great for people who like to interact with their jewellery. Wear it on it's own, or team it with other bracelets from the Covet Collection for a completely on-trend look. Bracelet length: 18.9cm plus a 1.2cm extender.